This is so pretty, Mo! So pretty! Love the blended inks! Oh I love it Maureen. I haven't tried stencils yet. Your card is truly fabulous. Thanks so much for playing with us at Fusion. I love this design, Maureen! Wonderful combination of stencils, sequins and stamps. Thanks so much for playing along with the Simon Says Stamp Wednesday Challenge: Stencil It! Love your Fusion card Maureen, the sweetest butterflies flying off the card! Beautiful inking through the stencil :) Thank you for sharing with Fusion ! 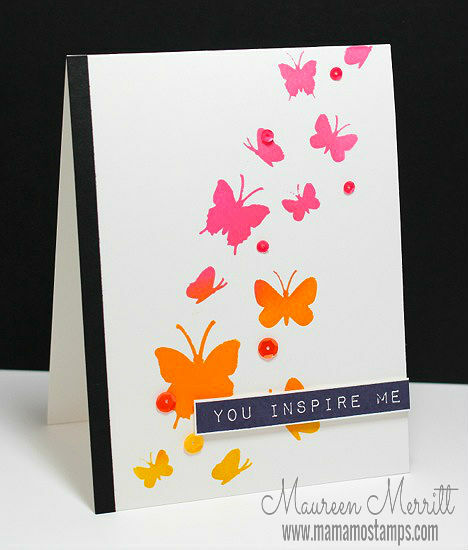 Love your beautiful flutter of butterflies on this pretty card Maureen! thanks so much for joining us at the Fusion Challenge! Great job Maureen. I love the butterflies and their colors. Such a nice CAS card. "You Inspire Me", thanks! Cute card, love the flurry of butterflies!